How much do you know about Latin American cuisine? 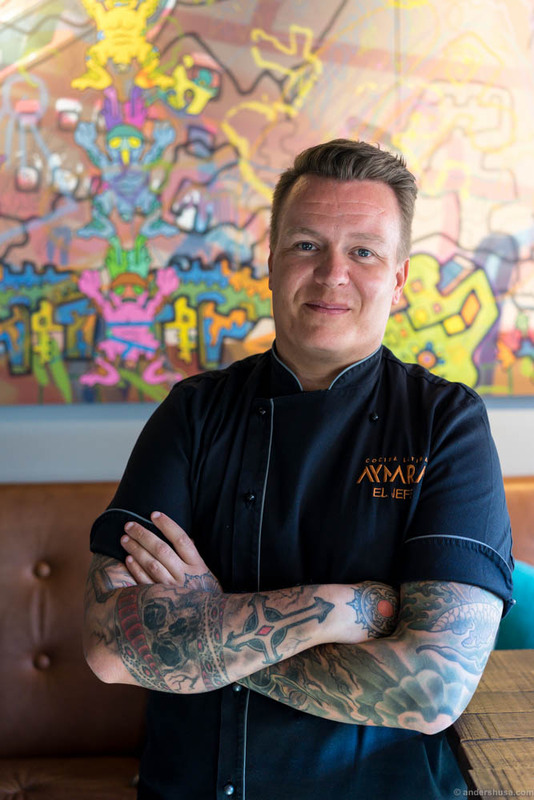 I sat down with the head chef at restaurant Aymara in Oslo, Kim Daniel Mikalsen, to learn more about some of the dishes that define the cooking of the South-American countries Peru, Chile, Argentina, Bolivia, and Equador. Together, we tasted our way through the classics on the Aymara menu and selected a unique four-course menu that Aymara will have available for a limited time only. The menu features all the favorites of Kim & myself, and reflects the long history of cocina latina! 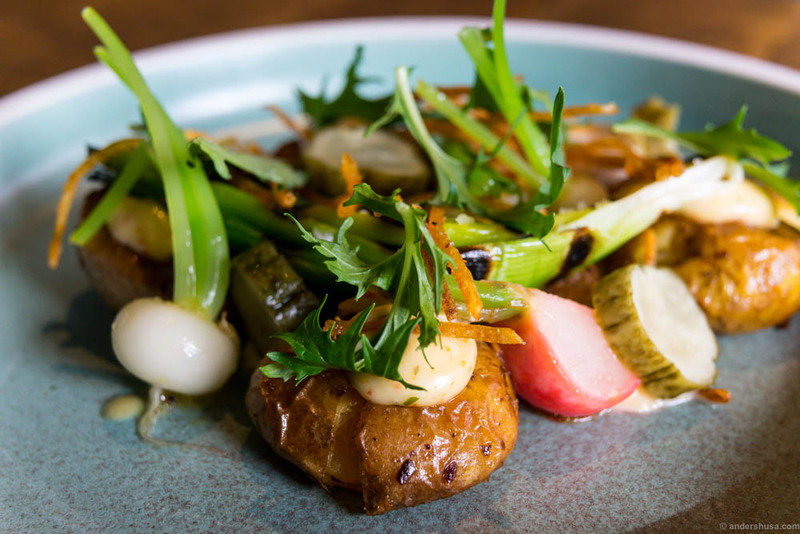 Cocina Latina is what Kim calls his concept at Aymara, but what does he mean by that? In short: it’s modern Latin American food. Kim’s philosophy is all about using Latin flavors and techniques, but his team combines that with as many local and seasonal Nordic substitutes as possible – like Norwegian seafood or Nordic vegetables. Aymara’s presentations also stray away from traditions and lean more toward a Scandinavian look. In addition, chef Mikalsen lives and breathes sustainability in his choice of produce. The fish is preferably caught wild and he’s not afraid of using by-catch. Lastly, Kim loves lots of spice, umami, and a punch in the flavor of his food. When researching for the restaurant back in 2014, Kim and co-owner Rodrigo Belda visited 32 Latin American restaurants in 16 days. Although, the goal was never to replicate their food, but rather to get inspired to make their own versions. By now, most people know about ceviche. Fresh, raw fish, cured in citrus juice for a short time, which breaks down the proteins and give the fish an appearance of being cooked. Seasoned with salt, perhaps pepper or chili, and mixed with onions, sometimes sweet potatoes, corn, and avocado. Aymara has a classic version on the menu called ceviche Miraflores – inspired by that particular district in Peru. Tiradito with wild halibut, wasabi mayo, mango, pomegranate, sesame, seeds, and kimchi. 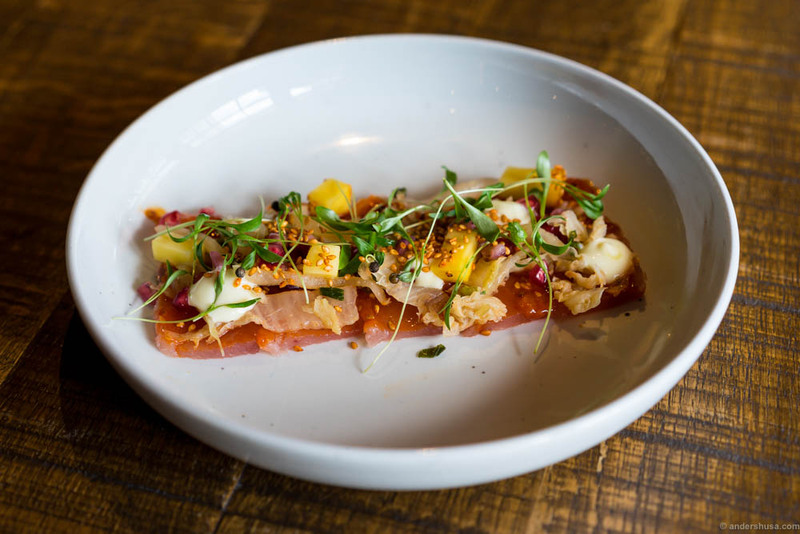 How about tiradito – is that almost the same as ceviche? «Close, but not quite», Kim explains, “tiradito is the result of influence from the Japanese immigrants on Peruvian cooking.» While ceviche is cut in cubes, the fish is sliced in order to make tiradito – just like Japanese sashimi. The other major difference is that the fish is not marinated and cooked in acid, instead, the sauce is applied just before service, more like a ponzu, and hence the fish is actually raw. As with ceviche, the key to a good tiradito lies in the quality of the ingredients, which have to be ultra fresh, and in how you cut the fish, i.e. the thickness of the slices. The rest is up to each chef’s imagination. Mikalsen makes his tiradito with freshly caught wild halibut, a special spicy and citrusy sauce, wasabi mayo, mango, pomegranate, sesame, seeds, and kimchi. Sweet meets salt, salt meets acidity, acid meets fat, and the tender fish gets a bunch of crispy elements to contrast the texture. Crunchy and tasty! There are about 5000 different potato varieties worldwide, and Peru and Bolivia are said to have had more than 4000 local species growing in the Andean highlands alone. Still today, there are at least a thousand different potatoes being grown in Peru. No wonder potato is a vital element of a classic Latin American diet. Potatoes are like wine grapes, they change according to the terroir where they are grown. As an example, Kim tells me about how varieties that grow near the sea can be naturally salty. 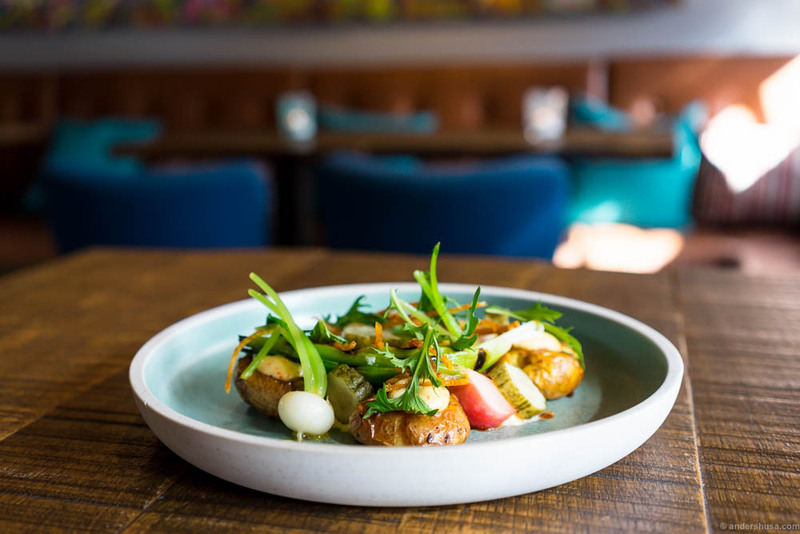 Fresh potato salad, with crushed new potatoes, a mayo seasoned with dashi powder, tōgarashi spices and dried seaweed, spring vegetables & pickled cucumber. «We always have a potato dish on the menu,» Kim says. «It’s seasonally based and we like to have fun with that particular course.» The current version is called potato «nikkei». Nikkei is the mix of Japanese and Peruvian cuisine. Traditional creamy potato salads in Peru were adapted to please the Japanese workers by adding familiar seasoning and toppings. Kim makes a fresh potato salad, with crushed new potatoes, a mayo seasoned with dashi powder, rice vinegar, soy sauce, shichimi tōgarashi (a Japanese blend of seven spices), and dried seaweed. Combined with crispy potato sticks, the first radishes and turnips of the season, pickled cucumbers, and a ramen egg. It’s warming, hot, crunchy, and so, so satisfying. Sometimes, cooked potatoes are the best thing in the world. Chicharrón is another classic Latin American dish that exists in all countries with a Spanish influence, consisting of fried pork belly and pork rind. In Peru, the pork is boiled in a pot with seasonings and spices till no water remains, and then continues to fry in its own fat. 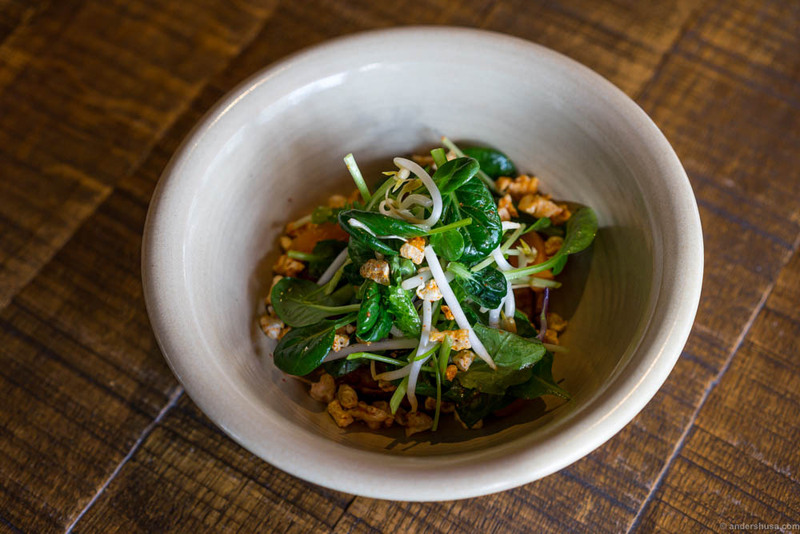 The current summer version at Aymara is a «nikkei» style salad. Kim’s team prepares the chicharron by removing the pork rind, cooking the pork belly sous vide in an aromatic marinade for 24 hours, chopping it up, glazing it in a homemade hoisin sauce and finally frying it at a high temperature until caramelized. It’s served with a seasonal salad, pickled sweet white peaches and topped with the deep fried, crispy pork rind seasoned with chili. Chicharrón in a seasonal salad with pickled sweet white peaches, topped with the deep fried, crispy pork rind seasoned with chili. La Bomba! 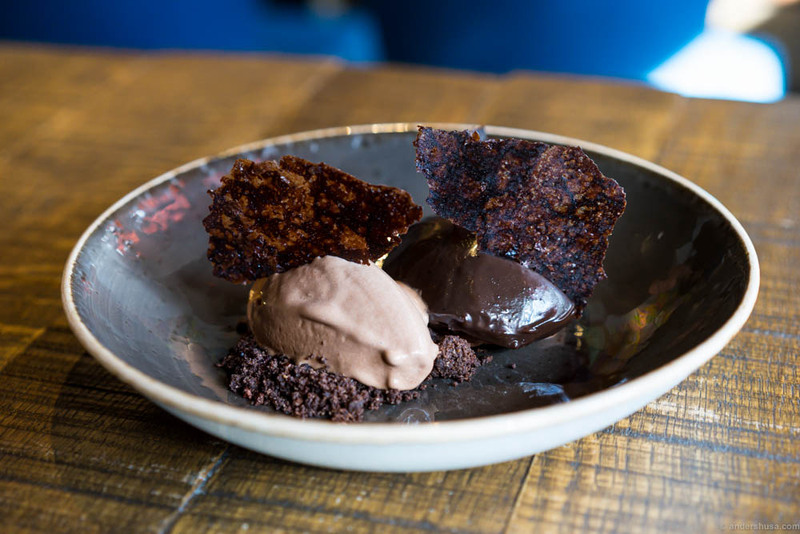 Chocolate mousse, chocolate dulce de leche, smoked cacao nibs, 70% chocolate ice cream with mezcal & chocolate chips. To achieve that harmony, they use a Peruvian fair trade series of chocolate from Valrhona with 70% chocolate which is less sweet and more bitter. Furthermore, the Aymara chefs crush and smoke cocoa nibs, which are used to make a crumble and a chocolate ice cream. The latter gets some mezcal added to it as well. The smokiness actually reduces the sweetness a bit. Aymara’s La Bomba is topped with chocolate chips. Despite the fact that I am not a big chocolate lover, I found it impossible not to finish each and every spoon of my bowl. This limited four-course menu, as selected by Kim and myself, cost NOK 495 at Aymara, and is a special offer to my readers for two weeks only. Book your table now! Just ask for my menu when you’re there. Remember, you can always drop by the ceviche bar at Aymara, where you can sit at the bar, eat some ceviche and other snacks – or even the full menu. Just make sure you order my menu before 9 PM! The kitchen at Aymara is open Tuesday through Saturday from 5 PM to 10 PM. The ceviche bar opens at 3 PM Thursdays, Fridays, and Saturdays. Sundays and Mondays are closed. Aymara closes for the summer from July 16th until August 8th. Did you try my menu at Aymara? Please, hashtag your photos #husa_aymara so I can see, or leave a comment. This is a paid ad for Aymara. I only see Peruvian food here. Where is the rest of delicious latin food from Brazil, Venezuela, Guatemala, Argentina, Colombia? Should be called Peruvian restaurant, rather than latin. Slightly dissapointed that the kitchen only serves your menu until 21:00. Leaving the venue now. Sounds like a good deal for a certified cheapskate foodie. Will try to find the time another day. Shame you missed it! Hmmm, will update with that information, I was not aware. Thanks. I guess it has to do with the time it takes to prepare and when the kitchen closes. Maybe so. I could still order all the dishes separately though.